CLICK HERE to sign up for My School Rewards email reminders and exclusive My School Rewards bonus points offers. EARN QUAD POINTS When you buy an Easter Bunny photo or merchandise, March 30 - April 20. 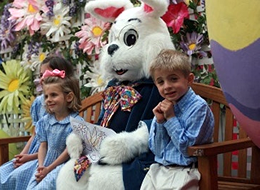 Visit the Easter Bunny, located on the lower level of JCPenney Court. Learn more at ShopVancouverMall.com. WIN A GIFT FOR YOU & YOUR SCHOOL! Two lucky customers will win a $50 Starbuck’s gift card, plus another $50 gift card for their school. From each qualified receipt entry made March 1-31 and April 1-30, we’ll select one customer from each month’s entries in a random drawing. Winners will be notified by email. Limit one gift card per person. Must be 18 years of age and bring a photo ID when collecting your prize as instructed in the email sent from shoppingpartnership.com. Shop and log receipts from Vancouver Mall between May 1, 2018 and April 30, 2019, then submit your receipts. Check out our short video to show how easy it is to submit receipts, even with a smart phone. It's easy to help your school win $400 to $3,000. Just shop at Vancouver Mall between May 1, 2018 and April 30, 2019, and submit your receipts. View the current My School Rewards flyer in a pdf format. Receive My School Rewards bonus points reminders via email. We’ll only email you once or twice a month, and we do not sell, give or rent your information to anyone. Watch your inbox for exclusive bonus offers available only to My School Rewards email subscribers. Sign Up Now! Vancouver Mall has contributed $22,000 to local schools through the My School Rewards program, which began in 2016. My School Rewards will contribute another $13,250 to 10 local schools this year to support school and classroom projects.